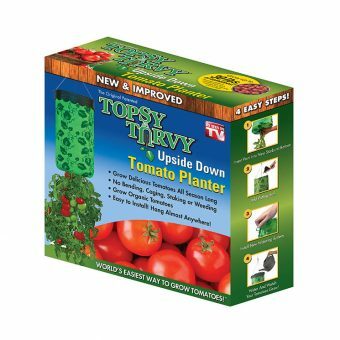 Topsy Turvy® tomato planter is the world’s easiest way to grow tomatoes! Works in a simple, yet ingenious way! Insert plant into the starburst port and add soil, sun warms plant & green colored bag attracts sunlight keeping the large soil surface warm. Install the new & improved watering system, gravity pulls water & nutrients directly from root system steadily. Enjoy juicy, ripe tomatoes! The planter acts like a greenhouse, and the root system explodes and thrives! Topsy Turvy® is easy to install; no bending, caging, stalking or weeding. Grow organic tomatoes as well as other vegetables with Topsy Turvy® tomato planter!